If the aquarium trade had a livestock popularity contest the Bangaii Cardinalfish, Pterapogon kauderini, would totally win. Bangaiis have been a first choice for many saltwater enthusiasts based on their great colorations and unique breeding habits. With such a demand, the fish have become nearly non-existent in their native home of Indonesia’s Bangaii Islands. It is guessed that over one million fish are captured annually. 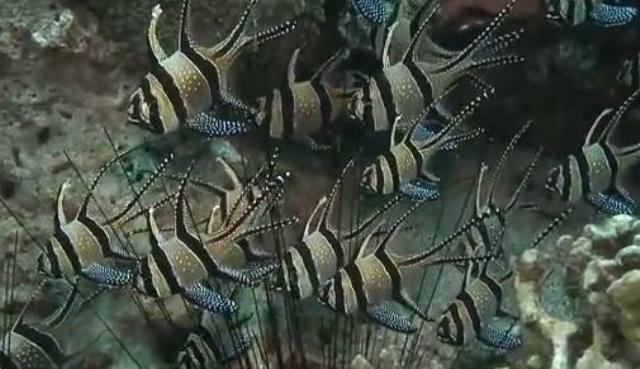 It is speculated that an fish exporter relocated the bangaii cardinalfish to the Lembeh Strait in Sulawesi. Located 250 miles north of their native homes, the Lembeh Strait seems to be a perfect vacation home for the fish. Populations seems to be thriving with little to no impact on the native fauna. Thank you Ana and Ed DeLoach for creating such an informative video that captures phenomenal shots of the Bangaiis in their new home. What great photography in that video. Some of the best bangaii images I have ever seen. Fabulous.